It’s not everyday that a TV superstar reaches out to inquire about making something new for them. So, when The Pioneer Woman Mercantile contacted us, we felt pretty honored! Earlier this year, we wrote about what it takes to make a new skillet, and the skillet making process is something we passionately enjoy and pride ourselves in deeply. 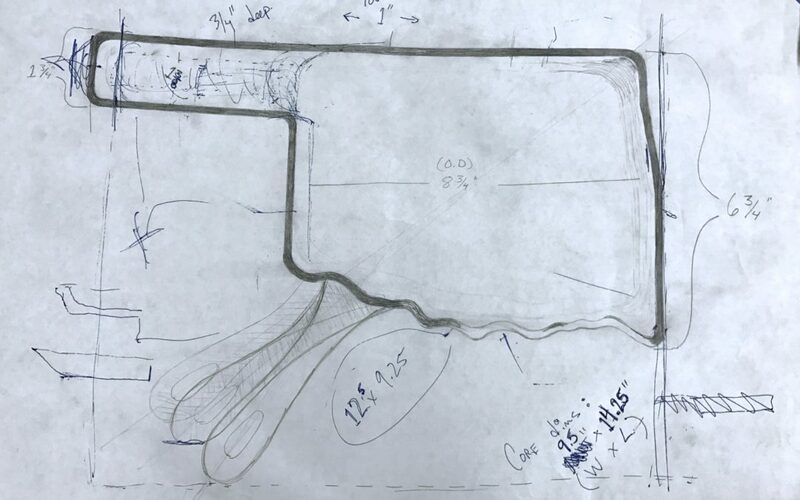 Creating the Oklahoma skillet for the new Mercantile was really no different, however with such an interesting shape, we had a lot of new things to consider! With careful and tedious concern for the ergonomics, balance, utility, and manufacturing logistics of it all, we chose to put the handle in a place that show cases the state’s beautifully unique shape, while allowing it to still be functional, ship-able, produce-able, and balanced when holding it in your hand. For the past four months, we’ve been designing 3-D drawings, machining, casting, tweaking and seasoning our way to a special new state skillet, and we couldn’t be more proud of the outcome! But just because the drawings are complete, doesn’t mean the development is over! Once the first few samples started coming out, we noticed a few peculiar marks in the castings that we didn’t really like. It took our whole team and a bunch of tweaking on the patterns to figure out where the issue was coming from! Turned out, this pan was so big, it was actually “crushing” the sand moulds during production!! Oh my! Thankfully, we have a smart team of engineers and foundry folks that knew what to do, and could remedy the issue to keep moving forward without too much delay. These kinds of hiccups can happen any where along the casting process, and it’s said that foundry trades have some 70,000 variables to overcome in order to come up with what we all recognize as a “normal” casting. It’s quite the feat! With the Holiday deadline quickly encroaching, everyone worked around the clock to get the castings up to snuff. Before too long, we finally started seeing sample runs with the quality levels that we designed and aesthetics that we require before bringing the casting onward into the finishing process. With just enough time to spare, we accomplished finishing up the 2nd new state skillet this year, just before the Thanksgiving Day holiday started. We are absolutely thrilled to see them in the Pioneer Woman Mercantile for shoppers this year and next, and we have a limited supply left over for Oklahoma fans visiting our online store as well. We look forward to seeing what culinary creations people come up with in this very unique shaped skillet. It leaves us to ponder what state skillet will come next!?! It will be fun to see what 2017 brings! As always, our next state skillet selection is in the hands of our fans. Every subscriber to our newsletter has the option of “voting” for which state they want to see happen next. Which one do you think it will be! ?